Time for some more desserts!! I want to put this recipe up really quick before we get into cookies, fudges, and bars for your holiday Christmas plates. I made this recipe as a Thanksgiving dessert because: 1) It is gluten free, so my mother-in-law can have it. 2) One of my sister-in-laws is from Brazil. And 3) I freakin love flan 😉 So if I can find any excuse to make it, I will. 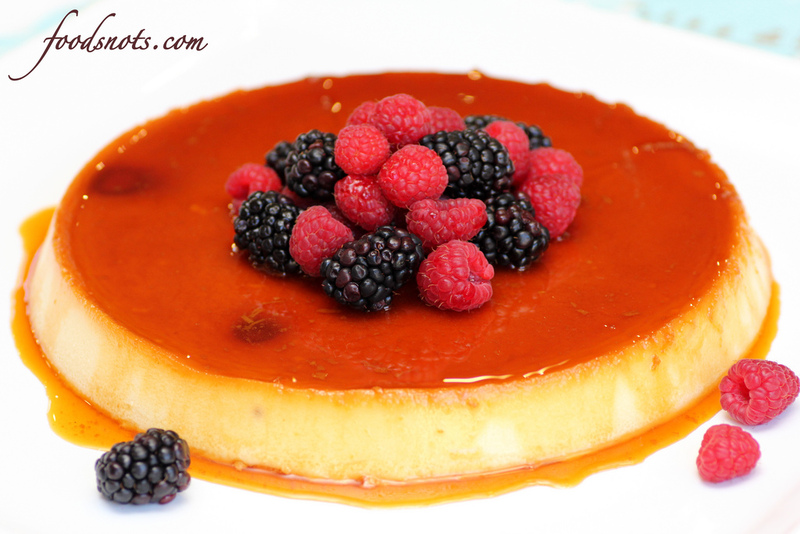 This recipe is a little different then traditional flan though. It’s almost like cheesecake and flan put together, and honestly, I thought the texture was so much better then regular flans. More creamy and custard like, instead of being so spongy. So amazing!! Enjoy! Cook 1 cup sugar in small saucepan on medium heat until sugar is melted and deep golden brown, stirring constantly. Pour into 9-inch round pan; tilt pan to cover bottom with syrup. Blend milk and cream cheese in blender until smooth. Add remaining sugar, eggs, vanilla and salt; blend just until smooth. Pour over syrup in pan. Place filled pan in larger pan; add enough hot water to larger pan to come halfway up side of smaller pan. Bake 50 minutes to 1 hour or until knife inserted near center comes out clean. Cool slightly. Carefully remove flan from water. Cool completely on wire rack. Refrigerate several hours or until chilled. Unmold onto plate just before serving. Makes: 8 Servings.